This fresh take on chicken salad has Spring written all over it. 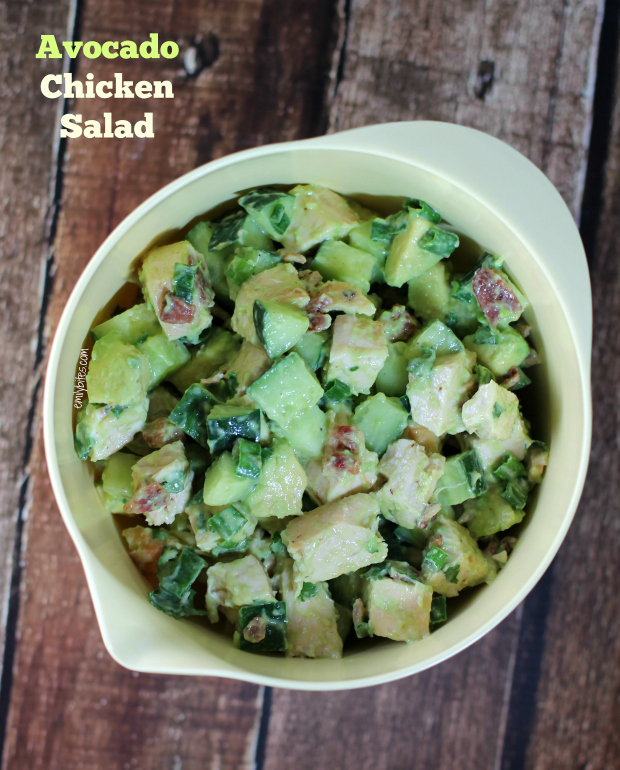 Cool, crisp cucumbers, chunks of rich avocado, a bit of creamy mayonnaise, the bright flavor of lime, a sprinkle of green onion and cilantro, and the smoky taste of bacon take this hearty and low carb avocado chicken salad to the next level. I ate this straight out of the bowl as a salad and also stuffed into a pita pocket for a sandwich. A serving is hearty and filling without feeling heavy – perfect for Spring! I am generally not a big mayonnaise fan, so I’ve been meaning to try making chicken salad with avocado. I still used a bit of mayonnaise, but adding rich, creamy avocado means you can use less. I started with a great recipe from Kalyn’s Kitchen and decided to add cucumber to fill it out with a little crunch and bacon for a salty, smoky twist to all the fresh flavors. The results were a big success and whether you make this to take for lunches or bring it to a Spring potluck, it’s sure to be a hit. Cook the bacon according to package instructions and then lay on paper towels to drain. When cooled, crumble the bacon into small pieces. 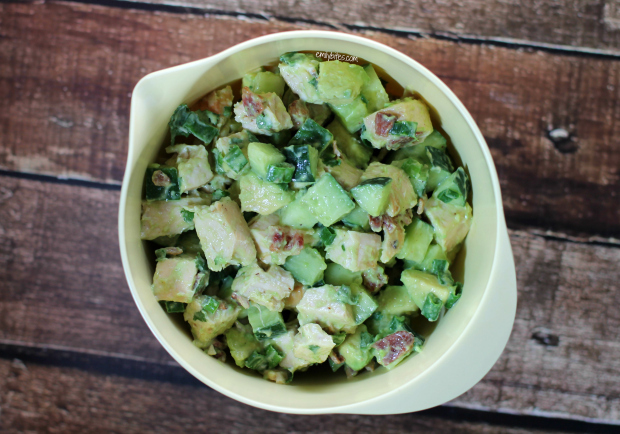 Combine the avocado chunks and lime juice in a large mixing bowl and gently stir to coat. Add the chicken, cucumber, mayonnaise, cilantro and scallions stir gently (so as not to mash the avocado) until well mixed. This looks delicious, I’m not a big mayo fan either but I’m sure with everything else it has going on you won’t be able to taste it much. When you say 2 cups of cubed chicken, how many chicken breasts did you use? 1/4lbs? 1/2lbs? You could also mash the avocado with the mayo to make avocado mayo. Maybe add a little lime. Wow! I made this last night and it really is delicious! My entire family, kids included, ate every last bite. I love how fresh it tastes! Thanks for sharing. So happy you all loved it! I’m starting a diet with this recipe. I could eat it for all my meals for a month and it would be delicious and cheap. OMG! This is SO good! I’m a Beachboday coach so I’ve shared several of your recipes with my Challenge group participants that are doing various workouts like P90X and T25, etc…I made this today and the only change was I didn’t have scallions so I used finely diced red onion. It was fabulous! Hubby loved it too! Love your recipes!!! Wow! Made this for my family and it was a total hit. Then I tripled it and made it for a bridal shower. It was the talk of the party. So light and refreshing yet totally filling. My mouth is watering just thinking about it. Thanks for sharing! 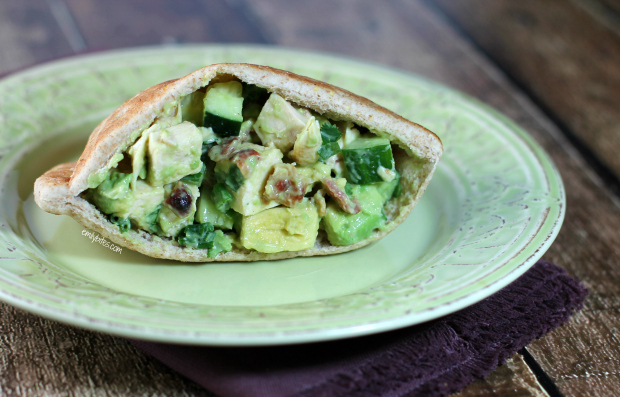 I put a serving in a pita pocket and it was awesome! I left out of the scallions and may cut down on the cilantro next batch but definitely making this again! I make salads like this all the time. I never use mayo. Try low fat or no fat Greek yogurt instead. It is a wonderful substitute for mayo and much healthier. Had one of these types of salads for lunch today with salmon, avocado, red onion and misc. berries, lemon juice and pepper. So I made a batch of this the other day so I could take it to work for lunch. SO GOOD. I did have a few changes (hate to be that girl, haha). I was too lazy to cook bacon so left that out, as well as the cilantro since I forgot to get it. I also used some frozen grilled chicken strips from Kroger that I was able to heat up in the microwave and then dice. It made it so easy. Definitely planning to make this again – it was enough to get me through 3 days of lunches at work! I ate it open-faced sandwich style on a Orowheat sandwich thin, which made it 8 PP+. I’m planning to add a cup of sliced red grapes & a quarter cup of slivered almonds next time I make it. I entered the whole thing into RecipeBuilder and I think it will keep it at 6 PP+ – adding the grapes will be enough bulk I think to make it 5 servings instead of 4. Thanks for all your great recipes! Hi, Emily! So glad to find your site! Made the Zucchini Casserole today and it was very yummy! 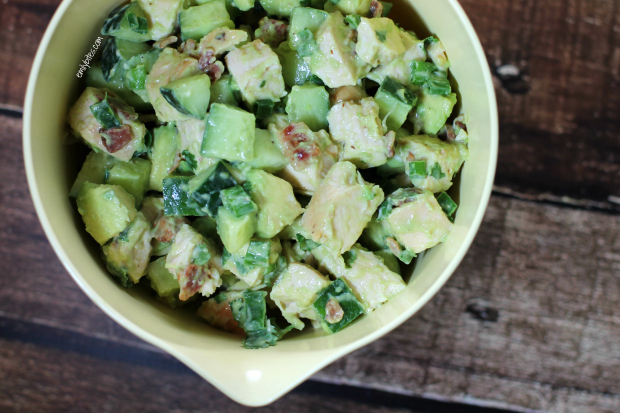 The Avocado Chicken Salad looks really good…what do you think of using tofu in place of the chicken? Hi Emily, I love your recipes and wanted to make this one for my lunch this week (in celebration of spring!) I was wondering if the avocados will oxidize if this salad is stored in the fridge for a couple of days? OMG!!!! Delish!! Made it as is minus the scallions. not a fan. Cant wait to make it again and again. Delicious! Served it over warm quinoa. Thanks.